This is a great game for improving your putting touch in the all-important 6- to 10-foot (2-3m) range. Using this game, you’ll quickly get better at matching the speed of a putt to its line. You will face several putts of about 6-10 feet in every round you play, each one usually breaking about 6-10 inches (15-25cm), so you need to start the ball well outside of the hole. 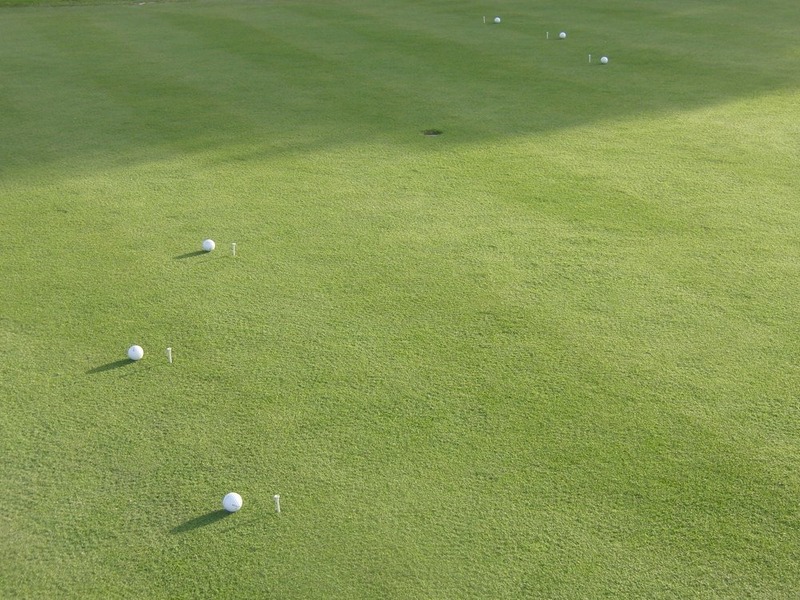 At this range, it’s not enough to just start the ball on line, you must also match the speed of the putt to the line you’ve chosen, allowing it to break the correct amount to hit the hole. 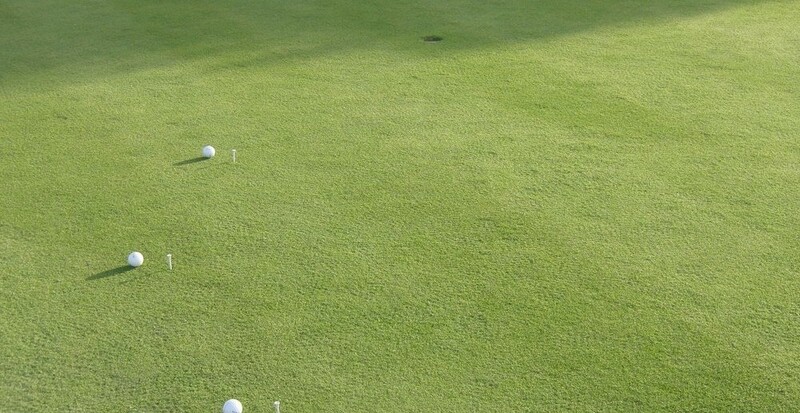 To play good golf, you need to have a reasonable expectation of making a lot of these putts, and you shouldn’t be leaving yourself more than a tap-in when you miss. Figure 1. 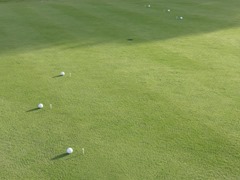 Setup for the Short Putt Touch game. Choose a hole on the practice green that is on a gentle slope, so that you can play putts from both sides of the hole that break about 6-10 inches from 8 feet. Mark 3 points on the green with tees, at 6, 8 and 10 feet from the hole, such that putts played from these points will break from left to right. Stagger the points so that you won’t have to roll the longer putts over the footprints you leave when playing the shorter putts – see Figure 1. Mark 3 more points at the same distances on the other side of the hole, so that putts played here will break from right to left. 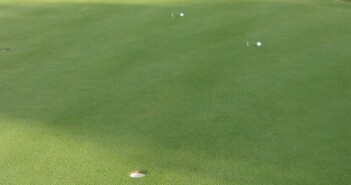 Play a putt from each of the six points you’ve marked, starting at each of the 8-foot marks, then 10- and 6-foot putts. Repeat, playing a total of 12 putts, two from each point. It is important that you perform your full pre- and post-shot routine for every putt. Go through your green reading process, take your time to visualise the stroke, practise your quiet eye technique, try the right amount and react to the target. Use your post-shot routine to actively build your self-image and learn from your mistakes. Always record your score in your practice session log, and try to beat your best score each time you play this game. The competitive edge is crucial. Figure 2. Putting game scoring chart. 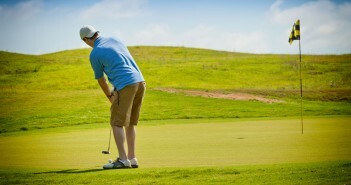 Putts that roll past the hole but stop within 18” (45cm) of the hole count as par, 2 strokes. Putts that roll past the hole more than 18” but stop within a standard putter length (34”, 86cm) of the hole count as 3 strokes. Putts that don’t meet the above criteria and stop within 2 putter lengths score 4 strokes, and 2 putter lengths or more from the hole is 5 strokes. So a par score is 24, and the best possible score is 12. It’s painful to even think about the worst possible score of 60! The inner semicircle of 18” past the hole is the area you should always try to leave missed putts. At the speed required to leave them here, they have the best possible chance of dropping in the hole, while still enabling the putt to stay on line close to the hole. 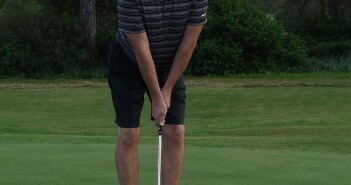 Play the putt faster than this, into the 3-point zone, and you increase your risk of lipping out. Faster still, 4 points or more, and you will leave yourself a testing second putt. And, for obvious reasons, leaving putts short is always costly. If the ball lips out and comes back towards you, it counts as if it was past the hole – so within 18” scores 2. Even though, strictly speaking, the ball stopped on the short side of the hole, the pace was good. When playing this game, you should be paying full attention and trying your best to shoot a low score. This is a great game to play against a partner in match play format, and it should only take about ten minutes. Toss a coin to determine who plays first, then both players play from the first point. Second putts are not putted out. The winner of each putt is the person who gets the lowest score. Play then moves onto the next point, where the winner of the last hole gets the honour. 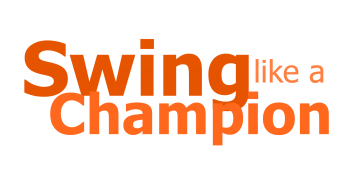 This game forms part of the Golf Loopy Putt like a Champion series, the sensational new putting game improvement system that will help you to improve every aspect of your performance on the greens. The improvements will be dramatic, and they will be permanent.